File Under: What were you thinking Mr. Nina?? It’s been a couple of years since I sat here on a Sunday morning and chatted about our snowmobiles. Why is that? Weeellll … let’s see, TWO winters ago when I went for a ride with Mr. Nina on what we affectionately call “sleds”, he 1) Got me lost on the top of a mountain and it took nearly 3 hours to find our way home. 2) He took me in the middle of the woods and dumped us sideways in a stream … which of course got us stuck … which meant he had to leave me ALONE in the woods for nearly 40 minutes while he walked out for help. And 3) On a gorgeous day he went screaming across a field and didn’t see a logging road and … well let’s just say that one landed me in the emergency room and a leg brace for ten days. Yep, it’s a brand new shiny sled. We picked one with all the bells and whistles. There’s a seat warmer and hand warmers and a big new comfortable seat. You see, there are no more children here to ride with Mr. Nina. So I thought … I really do enjoy touring through the forest on a beautiful winter day … it would be a nice way to spend weekend afternoons in the winter. Okay, so yesterday was gorgeous in northern Maine. Sun shining and temps hovering in the mid teens. Yay! 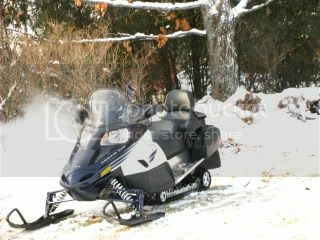 So after some maneuvering we got managed to get me geared up and on the sled. (Just a little reminder here that I have MS, my body has some special needs … but we don’t mind. Both Mr. Nina and I are used to dealing with that stuff. Anyhoodles …) Off we go. And you know, I’m loving this new sled. It’s more stable. There’s these cool rubber wind blocks for my hands and hand warmers in the handles. Ohhhh, I like. Though at one point as warmth spread across my bottom I thought I had bladder issues, turns out … there’s a seat warmer too. I’m loving this. Riding through the forest on the sled is the only way I get to see the beautiful scenery of the deep Maine forest. And the trails were awesome! Man, was I enjoying myself … for about 2 hours. As you would expect, I was getting a little stiff. I mean, it had been 2 years since my body had been bounced and jostled. Trust me when I say, sledding is great physical therapy. Anyway, we stop on the trail and get off the sled, stretch and walk around a little bit. I mention that perhaps we should be working our way home. Yeah, yeah, we’re just going to curve up here pick up some gas, sled down this way to a restaurant and grab some lunch then head straight home. I should have known something was up as Mr. Nina lilted his voice up, flashed his million dollar smile and said “besides, I need to put some miles on the new engine”. Yeeeeah … I should never have gotten on that sled. So we bounce and jostle our way to the gas pump and then to the restaurant, where thankfully I’ll get off, stretch my sore muscles and rest my hips which are now aching joints of fire and nourish my empty stomach. But noooooo …. the restaurant was closed. No rest for the weary. No food for the hungry. And we climb back on the sled and head straight home. Only, it turns out, home is now two hours and many miles of bumpy trails away. By the time Mr. Nina gets me home I can barely function. As he gets me in the house he just looks at me with a lopsided smile and said “perhaps that trip was a tad long”. Ummm … you think??? Yeah, FIVE hours may have been a bit much for me.